1968-1970 C3 CORVETTE FUEL / GAS DOOR BEZEL AND HINGE ASSEMBLY. ANOTHER QUALITY EC PRODUCTS DESIGN REPRODUCTION PART! 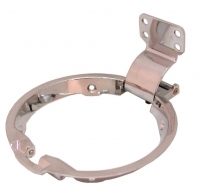 DIE CAST BEZEL AND STAMPED HINGE, WITH A HIGH QUALITY CHROME PLATING. FITS: 1968, 1969, 1970 C3 CORVETTES. Log In To See Pricing 1969-1970 C3 CORVETTE FUEL / GAS DOOR PLATE - UNPAINTED REPLACEMENT. GM PART # 3954544. Log In To See Pricing 1968-1990 CORVETTE FUEL / GAS DOOR EMBLEM ACORN NUT SET - 2 PIECES. Log In To See Pricing 1969-1973 C3 CORVETTE FUEL / GAS DOOR CROSS FLAG EMBLEM. DOES NOT INCLUDE ATTACHING NUTS.